The A Way Out Friend Pass lets you bring your best friend behind bars for free. When you’re breaking out of prison, you don’t invite just anyone along for the ride – your partner in crime has to be someone you trust. That’s why A Way Out lets you team up with a buddy from your friend list for its split-screen, co-op adventure, even when they don’t own the game themselves. You just need to use the Friend Pass. First, invite your friend to play with you in the game’s main menu. After that, they need to download the demo version of A Way Out. (Note that you’ll both need active PS Plus or Xbox Live Gold accounts to play on console.) See how it's done below. 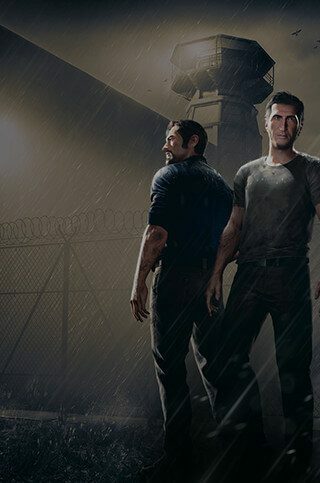 Have your friend visit the A Way Out page in the PlayStation Store. If they’re on their console, they can grab the demo from the “Demos” section. If they’re using an internet browser, they can click the “Try Free Demo” button beneath “Add to Cart. Have your friend visit the A Way Out page in the Microsoft Store and click “Try for Free” at the top of the page (in the same row as the “Buy,” “Get EA Access,” and “Buy as Gift” buttons). If they don’t see it, try sending the invite again – the button will only appear when their system registers that they’ve been invited to play. Have your friend visit the A Way Out page in the Origin Store and click “Play with Friend Pass” beneath the “Buy” button. The Friend Pass (marked as a trial) will then appear in their game library. And just like that, you’re on your way out! Step two is escaping from prison – but how hard can that be?